This system shows you if your vehicle has started even when you can’t see it! *$400-$600 MECP Installed! *Vehicles NOT equipped with transponder or immobilizer keys, such as certain Kia, Hyundai, Suzuki, etc. may cost LESS money below the base price. European Vehicles including but not limited to, Audi, BMW, Mercedes, Volvo, and Volkswagen are subject to a higher cost because of their complexity. Manual transmission Vehicles are also more. Please call 814.899.8885 for more details. *Remote Tells YOU If your car started! – No cut wires Some shops “say it” ENORMIS means it. – Professionally Installed by MECP Certified Technicians. – Parking Lights Stay lit while remote start is operating the engine. 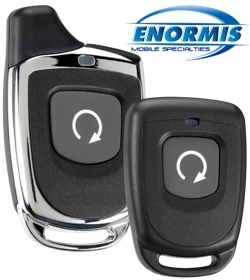 –Quick Stop Mode allows you to leave engine running, without the key in the ignition, while you run into a store! – Auto shut off after 15minutes. You can also stop starter by remote control. – Able to Monitor the Exact Engine RPM for a sure start and safety. – Compensates for cold temperatures, engine, etc. Smartphone App with virtually unlimited range! Read more about remote car starters!